We Search Trusted Retailers DAILY to find you the best deals on Super King Headboards and the latest Super King Headboards sale to save you money. Buying a headboard for a super king size bed isn't as simple as buying a cheap one for a normal single or double bed. The sheer size of a super king size means that any headboard you choose to get will be a far greater focal point than one for a smaller bed. Also bear in mind that they are also more expensive, so finding a cheap super king size headboard may not be the easiest thing to do. But the plus side of getting a super king size headboard are far better than the negatives. A fitted headboard for a king size bed gives the bed an instant makeover. It can also be a jump-off point to create a fresh look for the entire bedroom. A few extra touches here and there, such as colourful throw pillows for accent, can update a room with a more vibrant style. It makes sense to follow a few simple rules when it comes to buying something that may cost you a fair bit of money and will end up being a major feature in the room you spend most of your time in, albeit, when you're asleep. Materials for Super King Headboards Headboards may be made of so many different materials. There are no rules to this. They can be iron, brass, chrome, steel and that's just the metal headboards. They also come in wood, wicker, leather, faux leather, plastic or other synthetic materials. Material elements range from simple to stylish and even outlandish. We always recommend not going to overboard, especially on a super king headboard as this will be a massive feature and if to bright, will not look to good in the room. 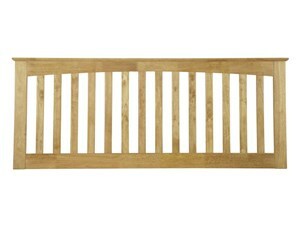 Super King Wood Headboards Wooden headboards are the conventional choice for many people. They look great in a traditional bedroom, and even a modern looking one can be great in a more contemporary bedroom. Solid wood headboards may be built from a variety of different types of wood. Just remember that solid wood can be expensive and different types, more expensive than others. Wooden headboards exude warmth and solidity, have a presentable appearance, and cost less than luxurious headboards. The neutral look of wood blends beautifully with other decor and colours in the bedroom. You can get a woodern veneer super king headboard. These can have a very good look about them and a good cheap super king wooden headboard for a fraction of the price of a solid wooden headboard. Super King Leather HeadboardsYou may think that the best days of a leather headboard are well behind them. But natural materials like leather are classic and never really go out of style. The headboard can be all-leather, or leather can be an inset to a wooden frame. Leather upholstery is a fitting match for a solid cheap super king size wood headboard. In fact, leather is versatile enough for you to get your creative side and let your imagination run away. Super King Metal Headboards These are usually the cheapest of the headboard materials you can get. Headboards made of low-cost metal can be paired up with other coverings if to make a unique, but low priced metal super king size headboard. It can be colour coordinated with the bedding and curtains too. Other than materials you can also look at the different shapes and sizes of king size headboards too. Headboards come in many shapes, from the simple rectangle to stylised Victorian and other designs reminiscent of period pieces. Edges may be curved or straight. More ornate designs have carvings, curlicues, or any other fancy and funky embellishments. Depending on the type of material, there’s an extensive array of finishes available, from clear lacquer to various coloured stains, dyes and paints. Super king size headboards are not a “one size fits all” accessory. They do not come in a single standard size. In terms of width, the minimum is 6 feet, 4 inches to accommodate a super king-size mattress. 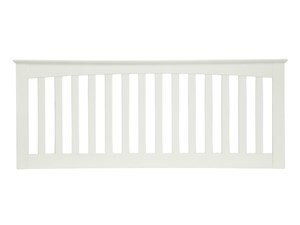 A typical width range for a super king headboard measures 6 feet, 7 inches to 7 feet. Usually the style determines how wide a headboard can be. The height of a super king headboard is were you can put your own stamp on it. Extra high super king headboards are very modern and look great in a new bedroom. One thing that we think is can be a big help when it comes to saving money on a cheap super king headboard and it's that you should have a good idea in mind about whet shape, style, size and material you want to have. People may be tempted to buy a headboard on sale on sight, and hope its dimensions and design as just about the right partner for their super king size bed. However, it’s better not to make an impulsive purchase just because the super king headboard is really cheap. Check a headboard’s dimensions against the bed frame and available floor space. Mentally picture its effect on the whole room. Before buying a headboard, it helps to sketch and plan the physical arrangement of the room. When buying a headboard for a super king size bed, keep in mind the practical, aesthetic and budget considerations. The cost may be worth it, since a matching headboard can definitely upgrade the look of a super king size bed. Once a headboard is installed, it can be an inspiring starting point to jazz up a bedroom’s boringly familiar appearance. Changing a few accessories to create a unified theme can transform the bedroom from drab to chic. Because of the sheer size of a super king headboard, you really do have to make sure you're getting the best value for money as it will be very visible for the time you have it. Shopping for a low price super king headboard can be fairly simple. Keep your reach small, and stick to Argos, Dreams and Mattress Man. These are the best 3 stores that stock a load of different brands and a wide range of prices too.